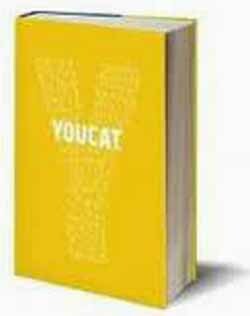 The aim of YouCat, short for Youth Catechism of the Catholic Church, is to present the teaching of the Church clearly, concisely and in a way accessible to the modern youth. Benedict XVI writes the foreword, inviting young people to carefully study the doctrine that they do not know, a generally acknowledged fact. 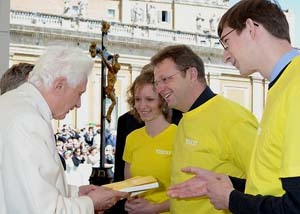 Some 700,000 copies of the YouCat in 13 languages are planned to be distributed free at the World Youth Day in Madrid in August 2011. First, I think it is an inappropriate name. Coining a slangish cute ‘youth’ acronym already implies a ‘dumbing down’ of doctrine. The name itself speaks of a lack of seriousness. Apparently some youth agree since I read that on some blogs the book has been renamed LOLCat (Lots of Laughs Catechism). It is hard to believe that such a mistake could be made on such an important moral issue, especially since most modern youth have wrong notions on this issue. Many are unaware of the firm stand of the Church against birth control. The YouCat ‘mistake’ adds to the muddle. The Italian publisher the Vatican chose to print its YouCat is Citta Nuova, run by the progressivist Focolare movement. It had already printed 45,000 copies of the book and sold 15,000 of them when the media started to point out the errors. Then the Vatican decided to recall the book and return it to the market with the errors crossed out on the pages and a correction slip included. Money-wise, it is a clever solution, but moral-wise it is a dangerous one since the correction slip will most probably be lost, and the printed/crossed out invitation to birth control will remain forever. Did Card. Christoph Schönborn of Vienna - responsible for the text of YouCat - apologize for this fiasco? He did not. In a meeting with the press, he put all the blame for the error in the Italian translation on Card. Angelo Scola of Venice, who supervised it. It is normal for translators to get a few meanings wrong, Card. Schönborn pretended, and for that reason “we need a second or third edition” to put things right. 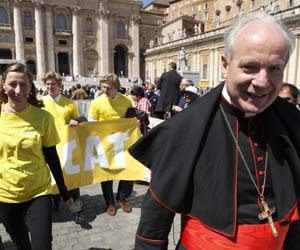 (“Vatican to Organize Corrections to YouCat,” CNS online, April 13, 2011). Schönborn also said he met with Card. William Levada of the Congregation for the Doctrine of Faith to ask for a “small working group” to collect “all the corrections coming in concerning the various translations – and also the original German.” That group will compile a list of corrections for subsequent printings (ibid.). What is amazing to me is why all these editorial measures were not taken before the final text went to press. What can Catholics expect from two Cardinals - Schönborn and Scola - who rush the approval of a doctrinal text of this importance as if it were a comic book. My surprise increases when I consider that the Pope wrote a preface to this book filled of errors. Did he read YouCat? Did he approve its content? Or did he write his preface beforehand, giving his stamp of approval to whatever his beloved disciple Schönborn would produce? What kind of doctrinal assurance can we expect from the present day Pope? Yes, let us be positive: He is also included in these messy doctrinal errors. It seems there are still more errors. In fact, the French edition of the YouCat has also been halted for its treatment of ecumenism and the presentation of other religions. The error in the Italian version of YouCat that sparked the controversy is found in question 420, which asks: “May a Christian couple resort to contraceptive methods?” The English-language translation of the same question asks: "May a Christian married couple regulate the number of children they have?" Both catechisms answer "yes" to the question. Yes, a Christian married couple may and should be responsible in using the gift and privilege of transmitting life. Sometimes social, psychological, and medical conditions are such that in the given circumstances an additional child would be a big, almost superhuman challenge for the couple. Hence there are clear criteria that the married couple must observe: Regulating births, in the first place, must not mean that the couple is avoiding conception as a matter of principle. Second, it must not mean avoiding children for selfish reasons. Third, it must not mean that external coercion is involved (if, for example, the State were to decide how many children a couple could have). Fourth, it must not mean that any and every means may be used. We are told that the couple must not avoid children for “selfish reasons,” certainly an ambiguous phrase that allows the couple to decide if they are being “selfish” or “unselfish” in choosing to contracept. There is no mention of sin, certainly not mortal sin. This was the clear teaching of the Church for couples - both young or old – until Vatican II. Now, instead of praise and encouragement for newlyweds to have large Catholic families, there is only talk of “responsible parenthood,” implying the necessary use of some sort of contraception. Question 421 opens the door to even more confusion and error. It asks: Why are all methods of preventing the conception of a child not equally good? The question itself presupposes a serious error: that there are good methods to contracept a child. It is implied that there are good, better and perhaps best ways to contracept children. The Church recommends the refined methods of self-observation and natural family planning (NFP) as methods of deliberately regulating conception. These are in keeping with the dignity of man and woman; they respect the innate laws of the female body; they demand mutual affection and consideration and therefore are a school of love. In fact, the Catholic Church always taught that contraception is a sin, not a lesser good. If the answers on contraception are so muddled, what can one expect to find in other topics?